Rotary File for August 1, 2017 | Rotary Club of Iowa City A.M. The students who attended the World Affairs Seminar and RYLA for 2017 were our guests today. Jack Cameron says that the hats are back! They were hiding behind a storage rack in one of the Kirkwood Room closets. Pres. Phil announced that it was Respect Your Parents Day, and that August 12 is International Youth Day. Our program today is to honor our youth who attended the World Affairs Seminar and the Rotary Youth Leadership Awards (RYLA) for 2017. Phil thanked Amy Nicholson for greeting, Karin Franklin for agreeing to do KP, Jack Tank for Meals on Wheels duty, and Jack, Roger and Brian A for set-up. Nancy Pacha introduced Peggy Dolson who will be the new Interact sponsor at Liberty High. Steve Hanson, the District RYLA chair from West Liberty, was also introduced. Those helping with TAKO on Saturday will receive instructions on the schedule. Mark Patton is recruiting volunteers to meet at the Coralville Recycling Center on Saturday at 10 am to sort a large quantity of recyclables as part of our Can Shed program. We will plan on doing our sorting at this facility rather than the Recycle Center because Habitat has recruited a sufficient number of volunteers to take care of the East Side Recycling Center needs for now. Bring gloves for the sorting task. The Food Fight concludes today and the Crisis Center is making its tally. We know that AM Club alone collected over 10,000 lbs of food and dollar equivalents. There were numerous Happy Bucks. We also celebrated in song August birthdays. Ethan Seylar and Callie Dains represented the three students who were sent to the World Affairs Seminar at Carroll College in Wisconsin this summer. The theme was "Education and Social Justice" and featured many great speakers who are authorities on the subject matter. Speakers included the first woman executive director of United Way, a documentary film maker, an urban farmer in the Milwaukee area, a teacher in Milwaukee who had stood up for the rights of transgender students. The message was the healthy food and quality education available to everyone are critical to social justice. Ethan believes the biggest weakness in the fabric of our educational system is complacency. 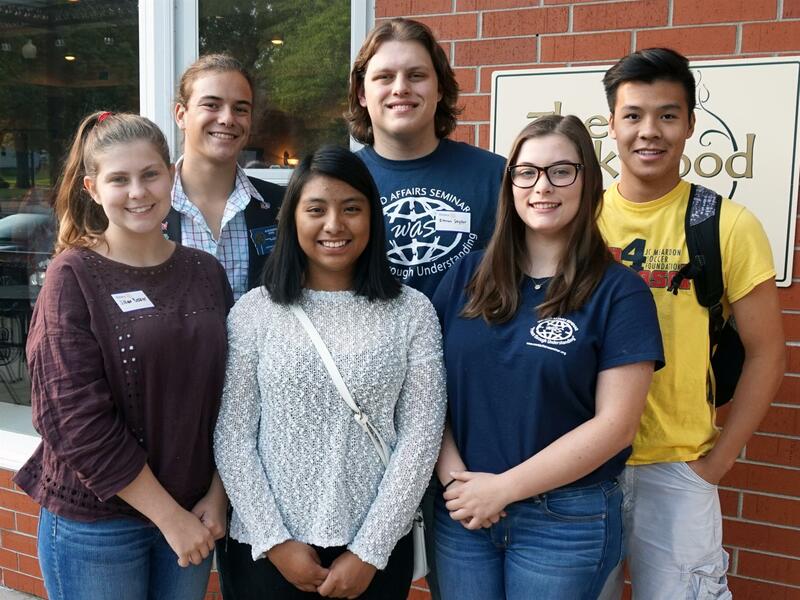 Six students were sent to RYLA by AM Rotary. Alek Krob started off with his perspective on how the RYLA week will aid him in his year-long exchange in Chile. Alek leaves for Chile later on this month. He felt RYLA was definitely transformative in helping to improve his readiness to accept other cultures and other points of view. He also made a strong suggestion that some of the younger Rylarians should consider going outbound through Youth Exchange to continue exploring other cultures and languages. Laura, Lottie, Jillian and Annalise all attended RYLA and felt uniformly that RYLA was transformative in its ability to get students to open up and share to the point where people who were strangers days before became closer than some people students have known all their lives. Exercised to build leadership skills and to find common grounds among personal differences were very useful. All of the students expressed their thanks to AM Rotary for supporting their participation in RYLA or WAS. Hieu Nguyen, a former Rylarian, returned to give a report on his Soccer balls to Vietnam project. Over $300 was raised to provide soccer balls to needy kids in Vietnam and the mission was accomplished this summer.